Most jockeys would probably tell you that the 30 fences around two circuits of Aintree’s Grand National jumps course are all challenging if the horse they’re riding doesn’t take to the unique spruce-covered obstacles on Merseyside. Changes made in recent years to the structure of fences – plastic birch is now used for the frame posts instead of wood – and their landings in the interests of equine safety may have reduced fatalities, but not fallers. Getting home over those Grand National jumps and the extended 4m 2f trip remains the ultimate stamina test for National Hunt thoroughbred horses. 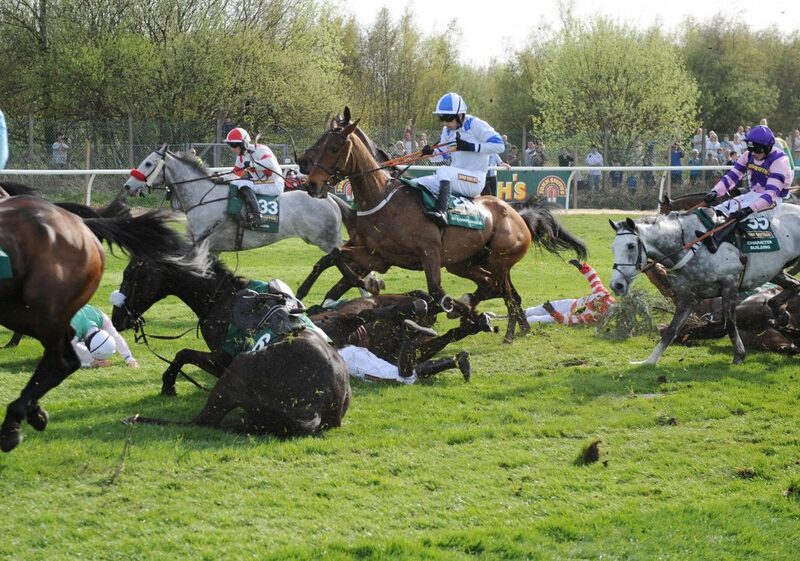 Even smaller obstacles can cause carnage at Aintree. The Foinavon fence – named after the 1967 Grand National winner – is a standard 4ft 6in in height and 3ft wide, but that didn’t stop a mass pile-up claiming all but one of the remaining field some 50 years ago. 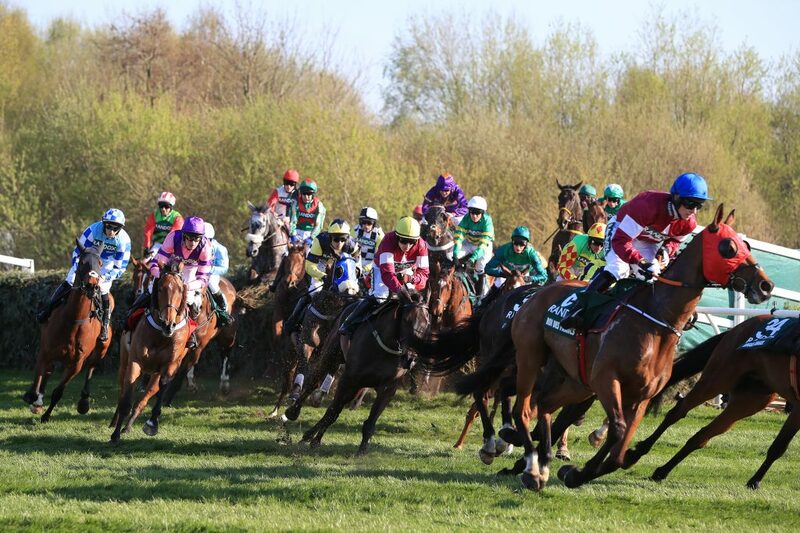 Despite moving the start some 90 yards closer to the initial fence for the 2013 edition, the first of those Grand National jumps still catches horses out. Some simply race far too keenly at the beginning of this Aintree marathon and, despite the spruce covering, it continues to have casualties. What about the Grand National jumps that are widely believed to be hardest, though? Year in and year out certain obstacles consistently claim victims, so we take a look at the history of three particularly notorious fences. Several horses fall at Becher’s Brook in the John Smith Grand National during Grand National Day at Aintree Racecourse, Liverpool. As the sixth and 22nd obstacle encountered on the way round Aintree, Becher’s Brook looks pretty innocuous when horses take off, but the landing is steep and jockeys must steer their mounts left-handed thereafter. 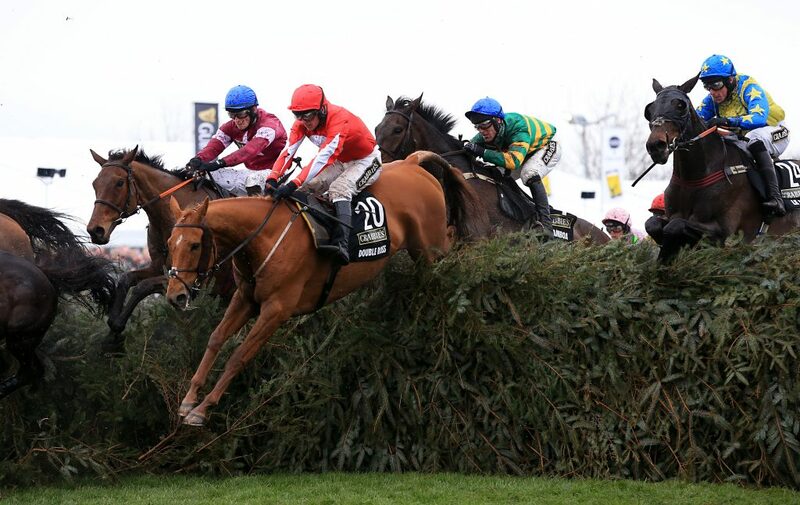 Becher’s is a 4ft 10in jump on the approach side, but a 6ft 9in drop to reach the ground over it. A good riding strategy requires jockeys to be brave and sit back, so their body weight stabilises the horse as they make this jump. This fence is named after Captain Martin Becher – a jockey who rode Conrad that fell here during the first official Grand National back in 1839. The original jump was set back from an 8ft brook with a dizzying 3ft drop in ground level from take-off on landing. Becher took shelter in the water to avoid getting injured by other horses jumping the fence. There have only been four occasions since 1975 – including the 1993 renewal of the Grand National, which was declared void due to a false start – where none of the field have fallen at Becher’s Brook. High-profile equine falls forced Aintree racecourse to modify this fence in 1989. The steepness of the landing side was levelled off substantially, but Becher’s continues to be hazardous. A pile-up involving eight horses also occurred in 2004. This led to the brook being rebuilt and covered by rubber mats in order to cushion the fall for both riders and their mounts. Aintree officials also had the Grand National jumps course widened in 2009 to include a bypass lane of sorts, giving veterinary staff the discretion to close off fences like Becher’s if needing more time to assess equine injuries. Bypassing Becher’s Brook during the Grand National happened for the first time in 2011. In light of yet another injury here, Aintree again modified the fence by further reducing the landing side drop. Runners and riders in action at the Canal Turn during the Randox Health Grand National on Grand National Day of the Randox Health Grand National Festival at Aintree Racecourse. Fence number eight and 24 of the Grand National jumps course is where the track pretty much makes a right angle. While Aintree today has running rails, if horses didn’t make the Canal Turn through almost 90 degrees early in the race’s history they would’ve ended up, literally, in the Leeds-Liverpool Canal. You can see where the name came from. Jumping an obstacle on the diagonal is a lot easier than it sounds. Doing it with 40 runners (in years past, more) where the course then runs perpendicular to a fence is truly daunting, however, with horses continuing to regularly fall at it. That’s despite the fact the ditch before the fence was filled in following a melee during the 1928 renewal. Easter Hero, top-weight and favourite that year, caused it by refusing and took out about 20 other horses from the race. A riderless Paddy’s Return caused similar chaos on both circuits of Aintree in 2001. It took until 2015 for the Canal Turn to be bypassed during the Grand National when vets gave lengthy treatment to the previous year’s runner-up Balthazar King, who injured ribs when taking a tumble. Rule The World ridden by David Mullins (left) and Double Ross ridden by Ryan Hatch (second left) jump the chair during the Crabbie’s Grand National Chase Grand National Day of the Crabbie’s Grand National Festival at Aintree Racecourse, Liverpool. As one of only two fences – alongside the water jump that follows it – that are only taken once on the Aintree Grand National jumps course, The Chair is the tallest and broadest obstacle for horses to negotiate. With no equine fatalities since 1979, both riders and their mounts clearly give this 5ft 2in fence beyond a 6ft wide and 2ft 6in deep ditch the respect it deserves. The death of jockey Joe Wynne in 1862 was the reason for the introduction of this take-off side ditch. Back in Grand National years prior to that, a distance judge would sit by this fence and, after horses cleared The Chair for a second time and reached the winning post, he recorded the finishing order from this vantage point. Originally called the Monument Jump, The Chair became a more popular name for the obstacle during the 1930s. With the landing side raised some six inches compared to the take-off position, horses have the opposite problem with jumping this than they do at Becher’s Brook. A couple of loose horses veering into the main body of the field at The Chair in 1979 led to a pile-up during which nine more were taken out of the Grand National at this jump. Rubstic, who won the race that year, came a cropper at this obstacle 12 months later, while 2007 winner Silver Birch was a casualty at The Chair in 2006. It’s one fence with a real capacity to catch even previous or subsequent Grand National winners out then.